The free version of Revo Uninstaller is well-known among PC technicians as a serious, no-nonsense uninstaller and system cleaner. Revo Uninstaller Pro ($39.25, 30-day free trial) takes the basic facilities the free version provides, and adds two key features that some users might be willing to pay for. The Traced Programs feature is Revo Uninstaller Pro's main selling point. When you uninstall an application with its included uninstaller or through Windows' Add/Remove programs feature, you’re actually running its installer again--this time with an instruction to remove the application rather than install it. Not all installers are made equal; some uninstallations are thorough, removing all traces of their application from your computer and leaving it squeaky clean. Others… not so much. Both the free and Pro versions of Revo Uninstaller offer the most important functionality, a powerful “leftover scanner” that combs your computer looking for files and registry entries that software uninstallers did not fully remove. 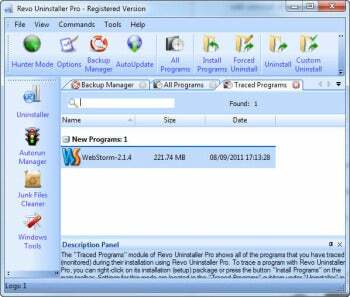 Uninstaller Pro takes this one step further, letting you do away with the application’s original installer. Revo Uninstaller Pro does this by monitoring installations: It includes a button labelled “Install Programs.” When clicked, it prompts you for any application you wish to install. It then pops up a toolbar on your screen, and runs the application’s installer. As you work through the installer’s sequence of Next-Next-Next buttons, Uninstaller Pro logs every change made to your file system and registry. Vendor Revo Group recommends you next run and configure the application you’ve just installed. You can finally stop recording the installer; by that time, Uninstaller Pro probably has a very complete log of all changes the application made to your computer. In the future, when you want to uninstall the application you’ve logged, you won’t have to trust its uninstaller to tidy up in its wake. You’d be able to remove it directly from Revo Uninstaller Pro, without even running the app’s built-in uninstaller. The second major feature Revo Uninstaller Pro provides is exporting the list of installed applications on your system. It can export many details about every application, including its size, version, installation date, and more. The resulting file can be an HTML document, a text file, or an Excel spreadsheet. This can be handy for accounting purposes and general record-keeping. In my line of work, I constantly install and uninstall applications. With Revo, I no longer have to rely upon every application’s uninstaller not to leave leftovers all over my system.